Georgia’s college towns are luring seniors who want access to cultural events and quality healthcare. For decades the only retirees found on or near Georgia’s college and university campuses were rumpled professors shuffling into the library or graying, but still diehard, alumni and sports fans. Today there’s a new – and in some ways energizing – force among modern retirees striding across the state’s campuses on their way to classes or concerts they will share with other students many years their junior. These new retirees are changing the communities where they live in dramatic ways. They are affluent, active and curious, and in most cases are undetected except to those who track them. Economic developers who ignore them do so at their peril, experts say. Few people considering where to retire have more carefully examined the American landscape than Rome’s Dr. Michael Jackson, who spent 25 years in the Washington, DC, area as a medical school professor of physiology and a researcher. As they approached retirement, Jackson and wife, Beryl, devised a plan for the next phase of their lives that called for first retiring somewhere on the coast, then trying a mountain community. The two pored over brochures, news accounts, internet enticements and spent weeks of vacation time visiting prospective sites before landing on the North Carolina coast, where they stayed for seven years. For their mountain experience the couple arrived in Rome in 2006. The area’s large and varied medical community could nurture Michael’s interest in physiology, and his lifelong appetite for studying the mysteries of the universe could be satisfied on any of four college campuses. Like most retirees, however, the Jacksons were most concerned with their health. It’s also important to Al Hodge, president and CEO of the Greater Rome Chamber of Commerce. With the largest private multi-specialty clinic in the state, two major hospitals and one of the best doctor-patient ratios around, coupled with a college town atmosphere, Rome is becoming a magnet for retirees. Hodge’s chamber of commerce has begun constructing a marketing plan to lure retirees, making Rome one of the latest Georgia cities to throw out the welcome mat to generations flush with cash and promise. In the process, Georgia is belatedly cashing in on the same economic phenomenon that made Florida fast growing and wealthy decades ago. Rick Duke, director of Georgia Tech’s Center for Healthy Aging in the Built Environment has been watching retirees flow into the state for years and has helped research the impact of their arrival. “Retirees typically bring in $400,000 in assets and $45,000 a year in income,” Duke says. For many retirees living in Athens the word has been out for years. Seven years ago when John Rudy and his wife Barbara were looking for a retirement site they visited their daughter in Atlanta. At her suggestion, they drove over to Athens. After John’s career in international finance, during which the couple lived in Europe and New York, the Rudys had formed their own profile of the community in which they would retire. “We decided we’d go someplace that is a university town and not a big city,” John Rudy says. That spur-of-the-moment trip to Athens seemed providential. “We were really charmed with the look of the place,” he says. And there was a chapter of the Beta Theta Pi fraternity at the University of Georgia. “I’ve been a Beta for 50-something years,” says the 78-year-old Rudy, who now serves as the fraternity’s oldest advisor. Rudy also leads a yearly classroom discussion called “The United States in the Changing World,” one of about 40 courses offered by UGA’s Learning in Retirement (LIR) program. LIR has some 400 members, and Rudy says the organization is girding for the wave of baby boomers expected during the next decade. “We’re recruiting baby boomers in Learning in Retirement to keep ourselves young in both spirit and in fact,” he says. Stratton, who lives in Oconee County, says her next priority was “to be within about 10 to 20 miles of a university.” All these conditions had to be met so Stratton could pursue her two passions – learning and horses. The Athens area’s popularity as a destination for retirees has generated plans for a new multi-faceted retirement community called Presbyterian Village Athens/Oconee. The community is being developed by Presbyterian Homes of Georgia, a Quitman-based organization already operating two retirement developments in the state. Presbyterian Village also is forging a relationship with Georgia Tech to create technology that helps seniors stay in independent residences longer. Rockenbach is working with both schools to create formal ties with Presbyterian Village in which retirees there could volunteer as subjects in aging studies and other research projects. Phyliss Isley, director of Georgia Southern University’s Bureau of business Research and Economic Development, has spent years tracking retirees’ movements. Four years ago, retirees Sandy and Bill Prentiss found Florida not at all to their liking and began searching the web and retirement magazines for a place to relocate. “We were being driven out of Florida by increases in taxes, homeowners insurance and auto insurance,” Sandy recalls. 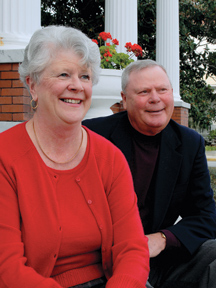 The Prentisses had planned to take advantage of Valdosta State University and Valdosta Technical College, but Sandy quickly jumped into volunteer work at a local arts center. Both now have part-time jobs, Bill as marshal at a local golf course and Sandy at the Valdosta-Lowndes County Chamber of Commerce. Since 2000, according to figures kept by the local chamber of commerce based on personal contacts, 210 new retired residents have directly created 420 new jobs and brought $88.2 million in new liquid assets to the area. Valdosta State’s retiree course enrollment has quadrupled, while the number of courses has increased seven-fold since 2000. A 2007 survey of 100 recently arrived Valdosta retirees found that hospitality, safety, healthcare, low cost of living, climate and educational and cultural opportunities topped the list of deciding factors in retirement site selection.